The Dundee manager Paul Hartley had been sent to the stand for being so overcome in his celebrations that he galloped off down the touchline punching the air, but he didn't even make it to halfway towards the tunnel before the final whistle sounded on the 2-2 draw. What to make of this game? In some respects, it was a typical meeting between two neighbouring rivals, full of intensity, effort and determination. There was barely a pause to allow the frantic nature of the play to subside, and composure tended to be left in the slipstream of the game's high tempo. The encounter was an indication of how far Dundee have progressed in the 18 months since Hartley took over as manager, but also of where a series of departures has left the United squad and the extent of the work Jackie McNamara has to do to maintain the team's standing. It was clear from the outset that Hartley intended to be assertive at Tannadice. He played all three of his strikers, although Rory Loy was not as sharp or vibrant as normal and may still have been feeling the effects of a recent injury. Even so, in the first-half there was a sense of purpose to Dundee's attacks. They could go long and try to play the pacy Kane Hemmings in over the top of the United defence, or they could try to build the play through midfield, where Gary Harkins was always reliable on the ball. Mostly, though, they still looked at their most threatening whenever Greg Stewart was in possession. He was a player of the year candidate last season and the summer has not blunted his instincts or ability. Stewart was able to carry the ball past defenders and was adept at cutting onto his dangerous left foot. The United defenders would have known what was coming when he received the ball on he right of the penalty area in the second half, but they were powerless to stop him skelping the ball into the the far top corner. With Hemmings' speed, Loy's movement and predatory instincts and Stewart's burgeoning talent, Dundee will be well served in attack. Paul McGowan was bright and lively when he came off the bench, but otherwise it was notable that Dundee had few attacking options in reserve. At times Hartley can switch around different duos as partners, but the favoured 4-3-3 formation means that keeping all three of them fit will also be key. The summer at Tannadice was spent regrouping, and McNamara's task this season is to try to develop another batch of young players, while still delivering results. Development and progress are difficult outcomes to balance. Coll Donaldson and Mark Durnan are still developing a partnership at centre-back, but they have experienced full-backs either side of them in Ryan McGowan and Paul Dixon. The goalkeeper Luis Zwick was tall and imposing at times, but will be concerned that twice he pushed away shots back into dangerous areas, with Nick Ross failing to convert one rebound, but McPake being more decisive in the closing seconds. For all of his undoubted potential, John Souttar is still a work in progress. McNamara clearly believes that he is better suited to a holding midfield role, but Souttar has not yet displayed the passing range, positional awareness, or running power to define himself as a midfielder. That can come in time, but this is a significant season for the 18-year-old, since the United coaching staff rate him highly and need him to prove his worth to the side. The same could be said for several of the attacking midfielders. Scott Fraser is a tall, angular player with a promising left foot and good footwork; Aidan Connolly is small but deft and clever, able to find pockets of spaces but still to show that he can cut through defences with his passing; Blair Spittal is mobile and quick-witted, and took his two goals superbly against Dundee, but spent much of the first-half being anonymous; while Charlie Telfer shares many of the qualities of Connolly but has also still to display his assertiveness. Simon Murray made a significant impression as a substitute, with his rangy running and eagerness to harass defenders. Murray is raw, and not yet ready to lead the line from the start of games, but there is potential to work with. For all that the two managers want to promote young players and have shopped shrewdly in the lower leagues - Dundee's Kevin Holt and Durnan were at Queen of the South last season, Stewart came from Cowdenbeath, and Spittal from Queen's Park, just as examples - the value of experience was clear. John Rankin was prominent in midfield for United, shuttling himself and the ball around the park reliably and usefully. He also steered Zwick away from trouble after the goalkeeper reacted angrily to a challenge in the first-half, and Rankin was a steadying influence throughout. The same applied to Kevin Thomson, who kept popping up in space to take the ball from team-mates under pressure and whose calmness spread through the side. Thomson's influence was even more keenly felt when he left the field injured, since United took advantage of their opponents losing the holding midfielder to score twice in two minutes. 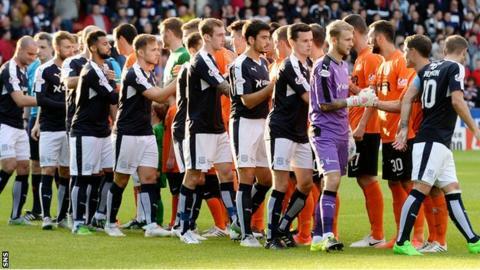 At this stage of season there is no way of knowing which of the Dundee clubs will finish above the other. It can be said, though, that there is little between them.